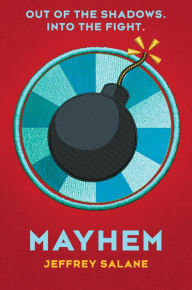 MY BOOK, THE MOVIE: Jeffrey Salane's "Mayhem"
Jeffrey Salane grew up in Columbia, South Carolina, but moved north to study in Massachusetts and New York City. After spending many years playing in many bands, he now works as an editor and writer, and lives with his family in Brooklyn. My running joke about Lawless was that it was created with Suri Cruise in mind. That eventually she’d read the book or her parents would read the book and they’d all realize that this is the perfect first vehicle for her action movie career. She would play M Freeman, the main character in Lawless. She’s at the center of all the action and adventure, but her character is morally challenged in a way that kids aren’t used to reading. She’s a bad guy who has to choose whether she’s going to be good. The other roles, I have no idea who would fit them because these characters are so young. If I’m pulling from actors from my cinematic history, I’d say that Henry Thomas from ET could play Calvin Watts. He’s a bit of the foil to M’s character and hey, I love Henry in ET. Merlyn Eaves, who’s the loud and proud geek of the group, I’d call on Third Rock from the Sun era Joseph Gordon-Levitt without the long hair. Then rounding out the main roles, I’d love to see Marsai Martin or Amandla Stenberg as Juliandra Byrd. Now, the characters I couldn’t find actors for are Ms. Watts and Zara Smith. They are two of my favorites in the trilogy, but I could never put an actor into either role. Finally, let’s have Justin Lin, Kathryn Bigelow, and Sarah Polley direct the film together because that is a movie I’d watch.